Just when you are beginning to see growth into a complete-sentence-talking, self-feeding, potty-trained, potentially reasoning-able individual, your child begins school which forces you to learn how to navigate a world fraught with “firsts” – the first time your child’s teacher calls to say your child made the whole class cry by telling them that Santa Claus was dead; the first time your child comes home crying because someone said they weren’t his friend anymore; the first recital where your child throws up from fear. You begin to think those years will not end, but they do, only to be replaced by the middle school years which begins a roller-coaster ride through the ups and downs of your child’s emotions where you learn that the hold the perceptions they have about themselves from the outside world seems stronger than anything you say or do as the parent in her life. You survive those years, too, but begin to wish to be back in them when the middle-schooler turns into the high school teen who hides in his cave-bedroom, believing you have no understanding, no wisdom, no sense, no anything that you can offer to his all-knowing self. You begin to actually doubt your abilities until the day comes when she is accepted into college, and anxiety about actually leaving home mounts, and she reverts to two year old behavior, wanting and needing mommy to hug and console and be with her at all times until she leaves. My second child, who is going to be graduating from high school has entered this last phase, and interestingly enough, her chosen way of spending time with her mother is that she suddenly wants to bake with me every other day – this of course being the same child who has been “too busy” to bake with me for the past four years and who now seems to think I should stop everything I am doing to bake with her whenever she is emotionally distraught about college. Of course, I do drop everything, because she is my daughter, I do want to spend time with her, and I also enjoying baking. 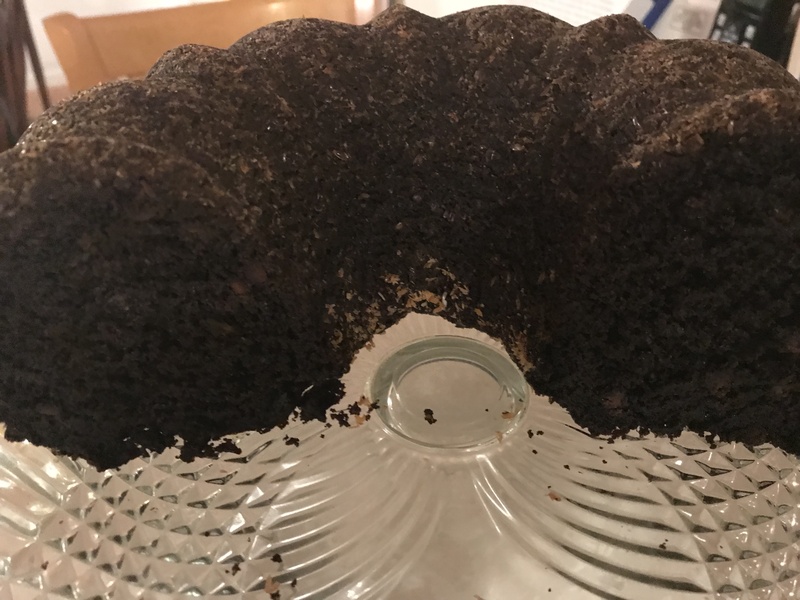 And this weekend, I taught her how to bake a chocolate bundt which I had revamped a couple of weeks ago when this same daughter had asked that I make a chocolate tunnel bundt cake for when my mother-in-law was visiting. 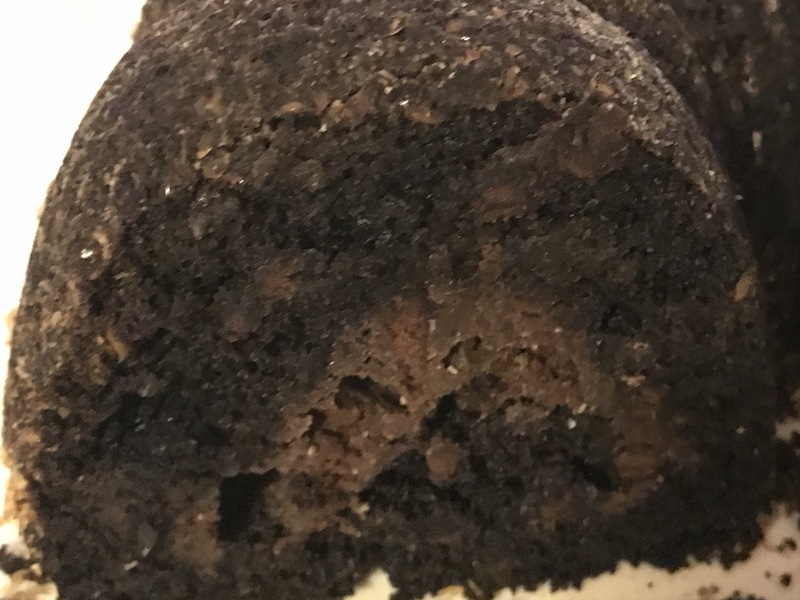 The original chocolate bundt cake recipe called for 3 cups of sugar, 1 1/2 cups of butter, 3 eggs, 3 cups of all purpose flour, 3/4 cup cocoa, 2 tsp baking powder, 2 tsp baking soda, 1 1/2 tsp salt, 1 cup coffee, 1 cup buttermilk, 1 cup pecans, 1 tsp vanilla, 12 oz cream cheese, another 2 eggs, another 1/4 cup sugar, 1/2 cup coconut, and 1 1/2 cup chocolate chips. It also called for a glaze made of 4 tbsp butter, 1 cup powdered sugar, 3 tbsp cocoa, 2 tsp vanilla, and 1-3 tbsp water. To revamp the recipe, I swapped olive oil for the butter and reduced it to 1 cup, and switched coconut sugar for the refined white sugar, cutting the amount to 2 cups. I used King Arthur’s whole grain gluten free flour in place of the white flour, and chose to use the special dark chocolate unsweetened cocoa powder for the regular cocoa powder. I reduced the salt to only 1/2 tsp. I made a “buttermilk” with soy milk and apple cider vinegar, reduced the eggs to two, and omitted the pecans altogether. For the filling: I reduced the cream cheese to 8 oz instead of 12, using the tofu version, and halved the eggs to one. I also omitted the coconut altogether and used Enjoy Life chocolate chips, reducing the amount to 1 cup of the mini chips. For the sugar, I once again used the coconut sugar, and I added a tablespoon of the cocoa powder and 1 tsp vanilla to increase the chocolate taste. Finally, I chose not to make a glaze. The result was a delicious cake which had less fat and sugar and calories as well as more protein and fiber. 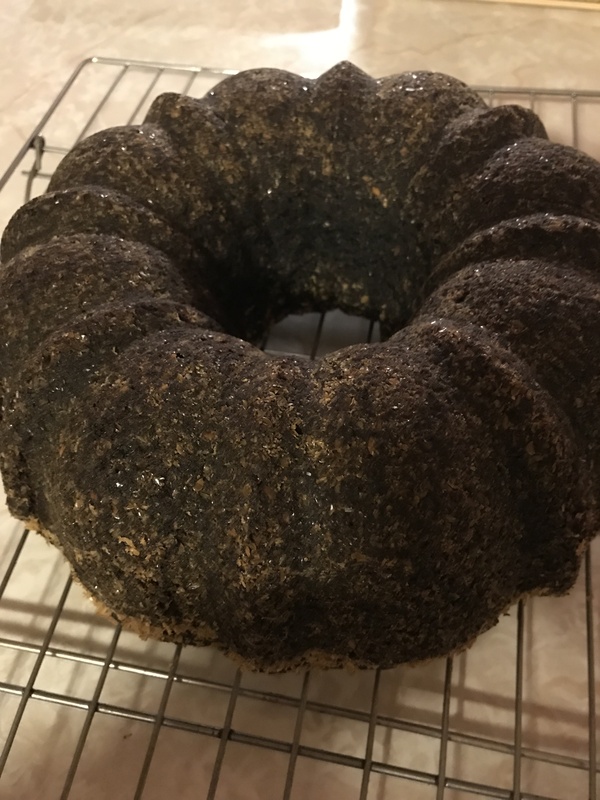 I’m including the recipe below for the cake which can be made as the tunnel cake with the cream cheese filling or as a plain chocolate bundt without the filling.